“This isn’t a Democrat thing or a Republican thing, it’s a math thing,” said Ryan. 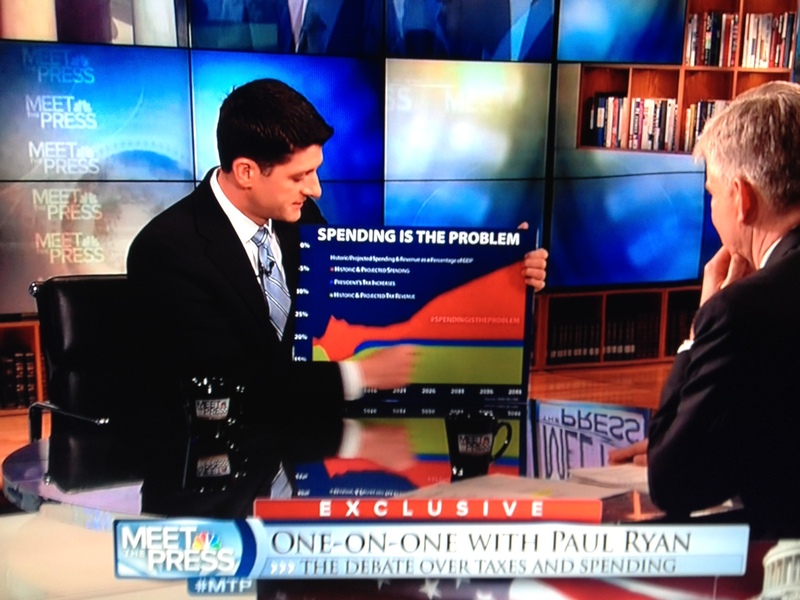 We will have a debt crisis, according to Ryan, it’s just a matter of when. He said he is not trying to impose austerity, in fact he said his party’s goal is to preempt austerity by making smaller cuts now instead of the drastic cuts that he said would come in a real debt crisis. Ryan said that his “maker versus taker” argument is actually an attempt to explain the real American dream, where people don’t want to live with the dependency on government. He said it is a strawman argument to say that he and his followers want to make drastic cuts to Social Security or Medicare. “We want a safety net, but we don’t want a culture in this country that encourages more dependency,” said Ryan. He said he thinks the Presidents inaugural address signals a move further to the left, and he said that will not be good for the country. Ryan signaled some moderation on immigration reform. He gave support to Senator Marco Rubio’s (R-FL) plan for “earned legalization.” On gun control Ryan said he supports a more robust background check system. He also supports more efforts on mental illness and rejected a call for “recycling the failed policies of the past,” likely a reference to the ban on assault weapons. When asked about party cooperation, Ryan said that if we had a President Clinton or President Erskine Bowles right now we would have solved this financial crisis already. He said it appears President Obama is more interested in political conquest then political compromise. NBC’s Andrea Mitchell said she sees real prospects for success on immigration reform. Gun control, however, will be a very heavy lift, she said. Gregory gave a preview of a rare joint interview with President Obama and Secretary of State Hillary Clinton airing tonight on CBS’ “60 Minutes.” He asked Andrea Mitchell if this was a “passing of the baton” regarding the 2016 Democratic presidential nomination. Mitchell said that everyone she talks to says that if Clinton decides to run (and she has not yet decided )this will clear the field. No one else will be able to challenge her, not Andrew Cuomo, Joe Biden, or Martin O’Malley. Bob Woodward of the Washington Post warned against counting Biden out.